After George Brown left the Vincent concern in 1951 he sadly missed his rides on "Gunga Din" and soon set about finding a successor. For about £5 he purchased a crashed Vincent and, after many hours of work, the result was a mount even more potent than "Gunga Din"! The fact that the machine had been burnt out when he bought it may have had some bearing on the name he gave it—"Nero"! As the machine was not a factory-owned job, it was practicle to incorporate many non-standard items in its specification. A pivoting-fork from a Velocette and a pair of A.M.C. "Teledraulic" forks were the two most obvious changes externally. Inside the motor, the whole crankshaft assembly was changed. The drive-side mainshaft, flywheel and crankpin were machined from a solid billet and carried in a much larger main bearing. The compression ratio of "Nero" in 1959 was 15:1, to take the maximum advantage of alcohol and nitro-methane full blends, yet the machine was quite tractable at low speeds. Gearbox internals were close-ratio, though under wet conditions only two or three of them would be used to get optimum performance over a standing "quarter". Maximum r.p.m. were about 6,800, at which speed some 85 b.h.p. was available. The machine was still being used, and improved, in 1961, the time of writing—it gained the solo sprint "kilo" record as we closed for press. 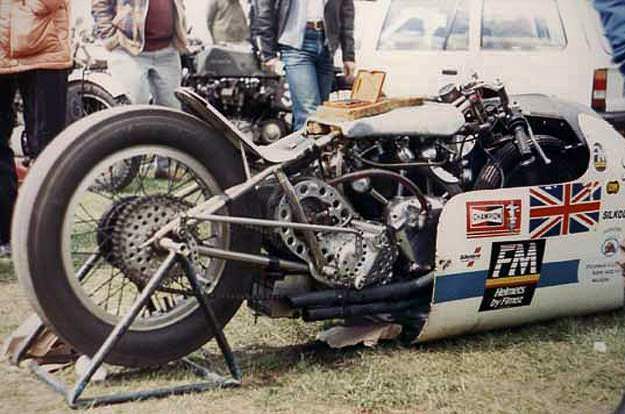 For quarter-mile sprints only a head fairing, seen fitted, was used. For longer distance a full "dustbin"-style enclosure was favoured, as it gave a considerable increase terminal speed. These pictures show "Nero" in 1959 trim. Engine: 50" Vee-twin 1,000 c.c. o.h.v. ; valve operation by high camshafts and short push-rods. Transmission: primary drive via triple-row chain with slipper tensioner to four-speed gearbox in with engine; final drive by chain. After the Brough Superior ended its career, the title of the Rolls Royce of motorcycles went to Vincent HRD, a British company that produced high-quality racing motorcycles. 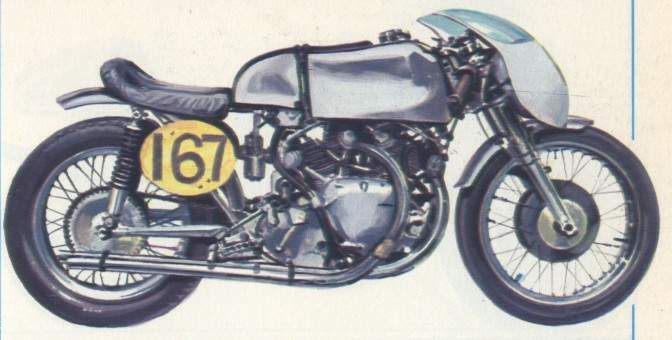 The racer George Brown worked for the Vincent HRD company for a while, leaving it late in 1951. 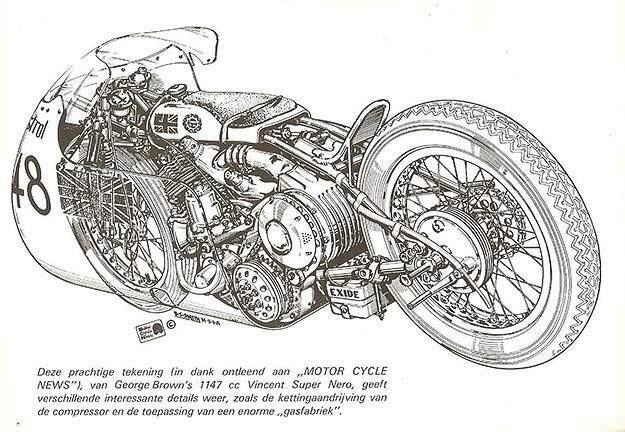 Brown started out racing a Vincent nicknamed "Gunga Din." Subsequently he bought a half-burned Vincent from a car wrecker, and after that he acquired a new prototype that was more powerful than the Gunga Din. This motorcycle he named "Nero." With the Nero, Brown became a star in standing-start racing. 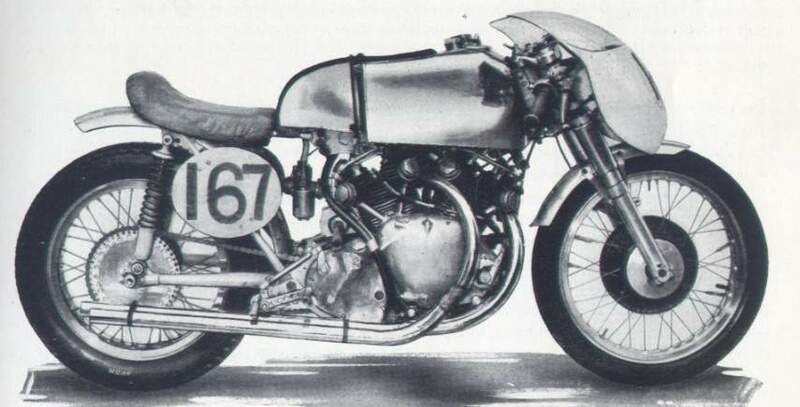 On November 13, 1960, he set a world record for the 1,200-cc. class with sidecar, riding a kilometer from a standing start in 22"6. The following year, on August 20, he set a world record without sidecar, at 174.986 km./h. Then, on June 20, 1964, he surpassed his own record by covering the standing kilometer in 19"47, attaining a speed of 184.814 km./hr. (about 115 m.p.h.). Brown's Nero was fueled by alcohol and nitromethane, with a maximum compression ratio of 15:1. In the final versions Brown successfully rode with a supercharger, which was allowed in standing-start racing. Power: 85 h.p. at 6,800 r.p.m.